It pretty much confirms what I've said all along about Legendary Bouncer and I really think we will be seeing Stealth Elf sooner than later. The Triple Pack of course will be there Day 1 and if you followed the blog you have hopefully already pre-ordered it! If you skim back to my Giant Hunting post from last week you can find the tabs at my TRU for not only L-Bouncer, but also L-Stealth Elf. Like I've said, you don't have labelled tabs/hangers if something isn't going to come out until December etc. The only thing up in the air is L-Chill. She hasn't been listed yet and thus far all Legendaries have been exclusive to TRU. I'll keep my eyes and ears open for any developments. I have a ton of stuff I want to post, but it is 4:15 AM and I've got to be up at 9 AM, which isn't a big deal, BUT factor in I need to be alert and functional at midnight for Skylanders at Walmart and possibly 8 AM at TRU and it becomes an issue. 2. 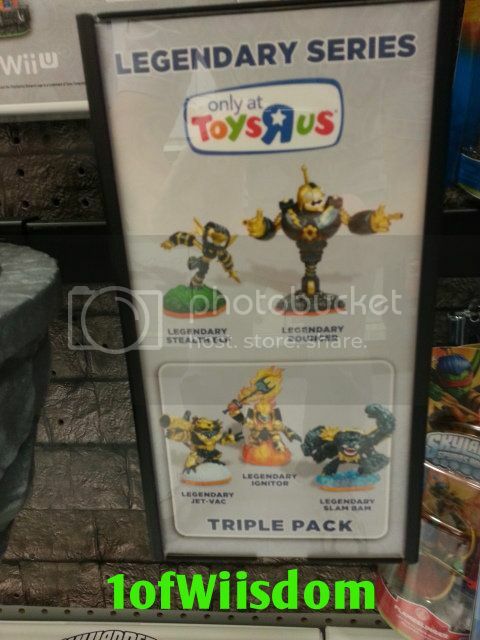 TRU is supposedly getting a Blue Wii Bundle with Skylanders Giants and Gnarly Tree Rex! This counters the other PS3 stuff we have seen across the pond. Retail was hinted at $149.99 and in all honestly that isn't a bad deal considering the game is basically half that price. If you don't have a Wii, your Wii is down, or you'd like Gnarly Tree Rex this is worth exploring...I'll keep you posted as best I can. 3. Walmart is having a midnight release and select stores will have the Skylander Scavenger Hunt I previously mentioned. Something I learned of Thursday night is that all TRUs will be opening up Sunday morning at 8 AM. And with that, I am off to bed...with visions of Giants in my head.